Notonecta glauca is up to 18mm long and found throughout the UK. It has a life span of approximately 6 - 9 months and can be seen all year round in ponds, lakes, canals and ditches, surviving on a diet of small insects, fish and tadpoles. Notonecta glauca are true bugs and are light brown in colour with reddish coloured eyes. As the name suggests, the Great Water Boatman swims upside-down, propelling itself through the water with its rear pair of legs which are fringed with tiny hairs. When in motion the rear legs resemble the oars in a rowing boat. Their ventral sides are covered with hairs which trap air and give the insects a silvery appearance in the water. Adults are able to fly. They hunt their prey by floating motionless on the water surface. When they detect movement in the water they swim towards it to see if it is worth catching. The bite from a Great Water Boatman can be painful as their saliva is toxic. 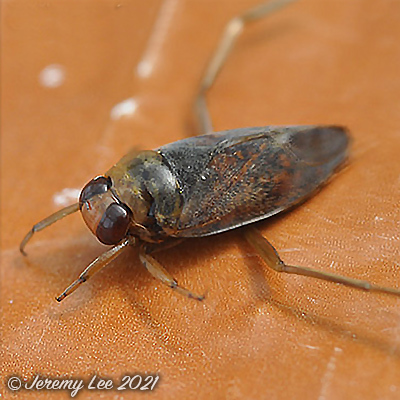 They should not be confused with the very similar looking insect called the Lesser Water Boatman (Corixa punctata). The Lesser Water Boatman swims on its front and feeds on algae.